We ask the men and women serving overseas to make the ultimate sacrifice, to protect the rights you and I take for granted. And how do we thank them? – by asking them to waive their right to a secret ballot. Massachusetts has a history of callousness when it comes to military voting, even to the point of non-compliance with federal law. The Uniformed Overseas Citizen Absentee Voting Act (UOCAVA) was enacted in 1986 to ensure that military members and other overseas citizens have the opportunity to vote in federal elections. In 2008, the Department of Justice threatened to sue the Commonwealth, for failure to provide data reflecting how many overseas voters were able to successfully vote. A settlement was reached with Secretary of State, William Galvin, who bears full responsibility for providing proof of compliance with federal election laws. A more recent federal law, passed in 2008, was the Military and Overseas Voter Empowerment Act (MOVE), which amended UOCAVA and required states to mail overseas absentee ballots at least 45 days before a federal election. It was that law that prompted the aforementioned states to change their primaries to accommodate overseas voters. Not Massachusetts. Instead, the Commonwealth offered electronic voting, gave them an extra 10 days to vote, and then called it a day. Some would argue that these voters voluntarily forfeit their rights. However, in Massachusetts, they rarely have a choice, as there is often insufficient time to mail the absentee ballots, especially to some of the remote places our military and other overseas citizens are located. In 2010 the District of Columbia conducted a now legendary experiment with electronic voting by putting it to a hack test. Within hours, students from the University of Michigan were able to override every single ballot and even take control of the security cameras. But even more terrifying was the discovery of computers from Iran and China trying to get in on the action. 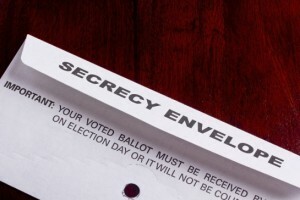 When voting absentee, it seems the best way to ensure a secret ballot is to mail one. But soldiers, facing tight deadlines may be faced with a difficult decision: waive their right to a secret ballot or don’t vote at all. At the same time we are learning about the scandals plaguing the Veterans Administration we are faced with the fact that “honoring those who serve” is not a sentiment shared by all. Think about it. To be valuable, the Secret Vote, must be the right of every voter that every other voter’s vote be secret. 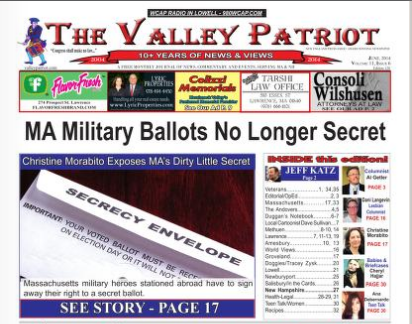 In Connecticut, the right to a secret vote is protected by our Constitution. This year, fortunately, the bill to pass a Constitutional Amendment was not voted upon – if it had, it would likely passed both house on consent – as they passed electronic voting last year – Republicans think it would be patriotic – Democrats are afraid to be labeled unpatriotic. This veteran says “Support our soldiers by waiving the flag, but do not waive the secret vote”.